One way to keep your cost of living low is to DIY — do it yourself! In this article, we share five creative DIY innovations that most people can make for themselves and use in their home. Several of these money-saving alternatives can become family activities as well. Likewise, the finished product are likely to make great conversational piece when you entertain guests. The couple behind RogueEngineer.com — Jamison and Jamie — showed their readers how to build your own little Lego Tray (they also referenced instructions for a DIY Lego Table if you’re more adventurous). 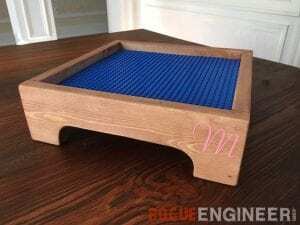 In their article, they provided step-by-step instructions, photos, measurements, and details for everything you’ll need to build this creative Lego Tray for your kids. Get their free DIY Lego Tray instructions here. It’s a no-brainer that fresh produce lasts longer when properly stored. In particular, most thick-skinned squash, potatoes, onions, and pumpkins can be stored for months after harvest under ideal conditions like those found in many basements and root cellars. 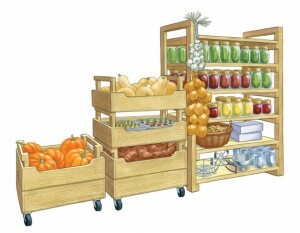 Mother Earth News shared some plans (and a slideshow) for making your own produce storage bins that you can use to turn your pantry or basement into a portable storehouse. These stackable bins can also be moved from your garden to your house and back again to help with harvest tasks. Get their free DIY Produce Storage Bins instructions here. It seems that most commercially-available closet organization systems are flimsy at best and really don’t work well. 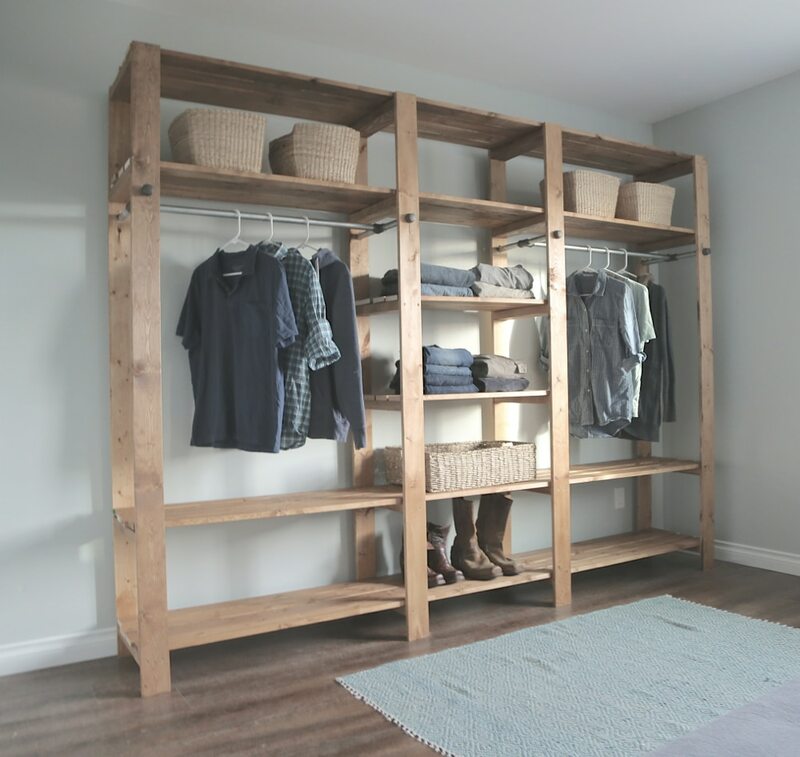 Ana White came up with a very simple DIY wood closet project and gives the plans away. 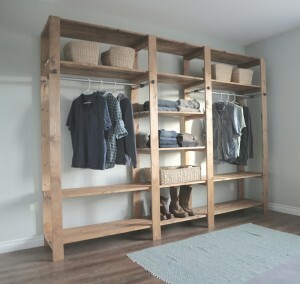 Get her free DIY Wood Closet System instructions here. Here’s another pantry innovation that’s ideal for families in particular. This creative design comes from Whitney & Ashley at Shanty 2 Chic and is for a canned food storage organizer system that you can build yourself. It’s designed to help you sort and manage your canned goods and keep them rotated so you use the oldest cans first. 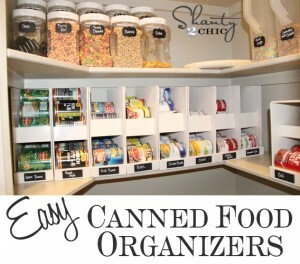 Each of the organizers cost just $5 to make and you can build as many or as few as you need to fit your pantry. There’s a supply list with photos and instructions for every measurement and cut you’ll need. Get their free DIY Canned Food Storage instructions here. Imagine making your kitchen or dining room table from just 2x4s and recycled pallets! There’s an Instructables article with step-by-step instructions and photos showing how to do just that. The completed table is very substantial and actually quite beautiful. It also looks like it could last a lifetime and provide solid service for everything that kids will throw its way. 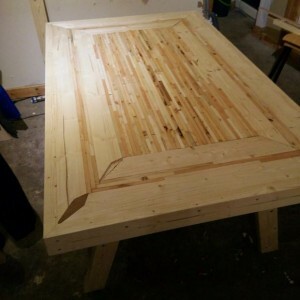 And given the way pallets are sometimes thrown out, this table could end up costing you almost nothing — except for time, patience, and a lot of glue! Get the free DIY Kitchen table instructions here. So, there you have it — five affordable DIY projects that can improve your home-life. Instructions, supply lists, and photos to do them yourself. When you’ve finished your project, be sure to add your comments and photos below for our readers! Thank you. I like the way you advise to use old and useless material of the house in such a mannered way so that it can increase the beauty of your house. You can add the beauty by adding Paper String Lights of your house.